It’s time for A Personal Photo Challenge! “Trees” is the theme this month. A sunset provides an attractive backdrop to counterpoint the graphic quality of these tree silhouettes. This scene was captured from our front yard. I merged three individual photographs to create the panoramic view. It is always a treat to catch a glimpse of mountain vistas like this as we travel on the Cherohala Skyway near the Tennessee and North Carolina border. 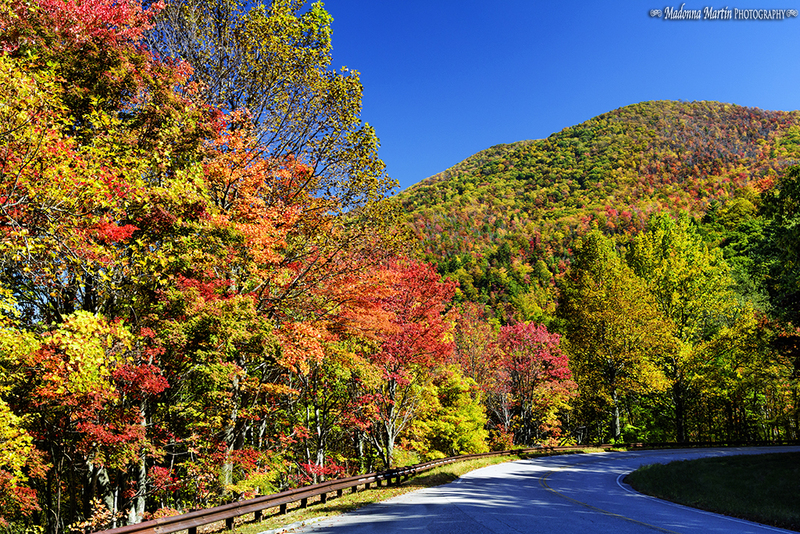 The foliage on the ridge shows how leaf colors have changed at different elevations. I used a polarizer to help mute mid-day reflections and provide saturation. Another photographer came over to stand in my chosen spot, once he realized how I was framing the scene up. He had a point-and-shoot camera and was wearing sunglasses. I suggested that he take the sunglasses off of his face and put one side over his camera lens. A light bulb went off in his head and he thanked me profusely for the tip. He said I just made his day! "You’re welcome," I replied! There is a grand old maple tree that sits right across the street from our neighborhood grocery store. The tree adorns the front yard of a vintage bungalow house. Everybody around our little valley knows to catch its glorious color show this time of year. It truly shines in late afternoon light. I love the contrast with the green foliage of another nearby tree. A moon sliver and lone cloud add to the composition. And yes, I used a polarizer on this image too. I hope you enjoyed my photos and descriptions. Please visit A Personal Photo Challenge blog and check out the creative efforts of other participants too! Stunning! I was out about 45 minutes ago just before the shadows began to draw. I don't have anything this marvelous. What I found over and over with my autumn photos was that the colors were not as vivid as I was seeing so I must rememer your polarizing tip...errr...your tip about using a polarizer. I have seen some wonderful entries sp far! 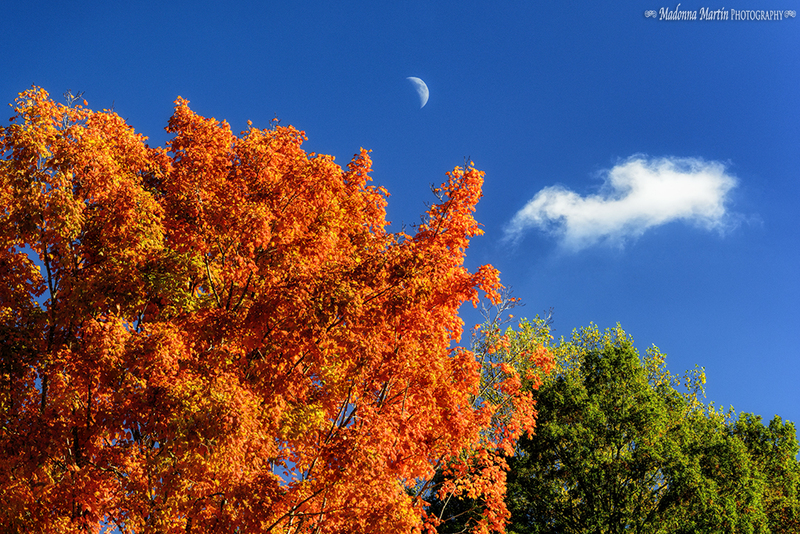 Gorgeous Autumn colors, lovely trees, pretty blue sky and moon.. Lovely images.. Truly spectacular leaves - the color is just amazing! What beautiful pictures! And too funny that you were giving photo advice - good for you! Love the third picture with the moon. Gorgeous! Oh my gosh, Donna! These are especially beautiful; love, love the colors. You always amaze me, my friend. Wonderful images, Donna. 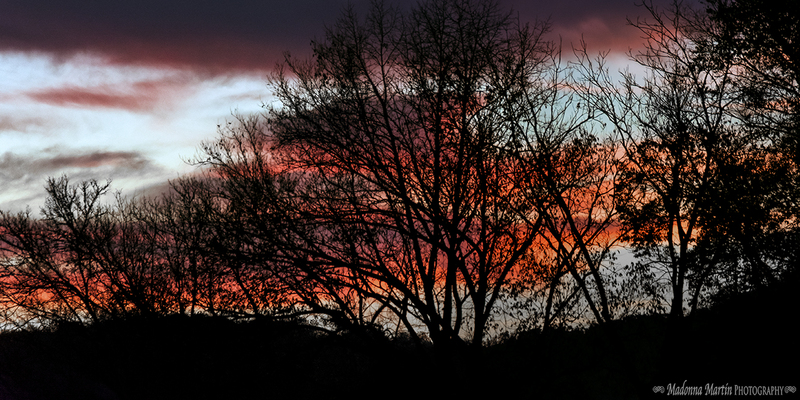 The silhouetted trees against the sunset are so vivid. I'm going to try that polarizing tip sometime. 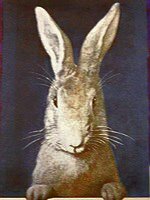 Thank you for hosting this link up - it's always great to see the interpretations each one has for the challenge. Love the autumn colors, ours are gone now. The grand old Maple is a real stunner, especially with the addition of moon and cloud! Love the colour of autumn you captured yet I must say I like the tree silhouettes best. Without the magnificent sky behind, they wouldn't be as attractive. Thank you for hosting our monthly challenge Donna. O.k. so now the only thing I've managed to retain as far as information from my photography class is the ISO and the polarized lens. Now I sort of know what you're talking about. I love that you include that in your pics. Thank you. I won't post, I'm too embarrassed by my shots. My best to you and Mr. Jim. All the Best to you and Mr. Jim. That dramatic shot of the sunset behind the trees...oh my. The vivid fall colors "around the bend"...oh my. The gorgeous maple tree flaming with color...oh my. These are lovely shots, especially the autumn colours. Suas fotos são sempre grandes aulas de fotografia! Obrigada e parabéns! Your photos are always great photography lessons! Thank you and congratulations! Yes, I was tempted to bring on the autumn tree pics too - they are so vibrant - but as I'd already shared several from the Asheville trip this week (and will have more) I decided to shop my archive and enjoyed returning to locations where there were amazing trees, all so different all so beautiful. Your pics here are truly vibrant - I would love to know how you get the cobalt blue skies Donna. Often my skies are washed out and no matter what I try I can't get a good blue. Love how you captured the moon here and, as always, any road pic is automatically a good one when the road curves changing the perspective. The sunset is magnificent - makes the end of day always special when the sun paints the firmament that way - there has to be a very special artist sharing the beauty of nature with us! Hope things are good - thanks for your input on my hip problem - more later on that. I'm mad this has happened! Beautiful pictures, Donna. I especially like the second one with the hill in the background. And I'd love to run into you and your camera somewhere picturesque. What a fun encounter. Beautiful colors in your pohots Donna! Thanks for sharing them...stoppin in from the photo challenge. Gorgeous photos! Wow, the polarizer works beautifully. Sorry I can't participate this month. Just not enough time. And I certainly have tons of tree photos I could have shared!! Oh Donna, these are such wonderful tree photos - you have captured the hues and tones as nature intended. I love the tip about the sunglasses over the lens, I can't wait to try it and when I do I will post about it! I agree with Mary's comment about there being a very special Artist sharing the beauty with us! Thank you for hosting amid all that's going on in your life - you're a gem. Fantastic! I love the silhouettes, that is a beautiful photo! Again I had wanted to enter this challenge, again, I didn't. :( Will go check out all the photos. Hugs! Beautiful Autumn colors, blue sky and, of course, beautiful trees in your photos. I think i need a polarizer ! :) Thank you for hosting! that moon sliver is wonderful! I always try to capture that too- but it often seems too far away in the photo- must keep trying- your sliver gives me hope! I see we both captured the moon in our autumn tree picture...I love when nature provides. I also have lots of trees silhouetted by either the setting or rising sun....I agree it is a perfect backdrop! All are beautiful but I especially love the one with the moon and the lone cloud! What a cool tip Donna! There are so many things you can do with just stuff you already own! LOVE your photo! All that color...I'm in love! Oh my goodness, all that color, how stunning! And the cute tip...thanks bunches. Great shots!